I teach students with a variety of native languages but most of my students are German speakers. There are some errors that I come across regularly and I’m going to post them here so that other German speakers can avoid making the same mistakes. If I ask my German-speaking students why they haven’t done their homework, they won’t follow the German grammar rules and reply “because I very much to do had and unfortunately no time had, my homework to do!” However, it’s natural that our native language influences our thought processes at times and this causes us to translate expressions literally or to express things in a way which isn’t right in the language that we are trying to learn. “For three years” means that something has been going on for three years. The duration was three years. I have been learning Turkish for three years. I began this activity three years ago and I am still learning Turkish. I lived in London for eight years. We know that this is an action that has finished because we have the word “lived” in the sentence. So I moved to London, stayed there for eight years and now I live somewhere else. “Vor drei Jahren” = three years ago. “When I was five = als ich fünf war but this isn’t what we are talking about here. There were five people in our English class. We won’t all fit around that small table. There are five of us. But avoid “we were/are + a number”. When describing how you feel, don’t make the verb reflexive. I feel happy/sad/tired etc. Perhaps I will write some other posts which look at conditional sentences in more detail but “would” does not belong in the part of the sentence which gives the condition. Depending on what you want to say, there are various ways in which we can write this sentence, but “if I would have” is not one of them. If I have enough money, I will go on holiday. If I had enough money, I would go on holiday. If I had had enough money, I would have gone on holiday. In German, we don’t have to think about adjectives and adverbs but in English, using an adjective where you need an adverb is wrong. Adjectives describe nouns: his singing was loud. Adverbs describe verbs: he was singing loudly. Our sentence needs an adverb because it is describing how she slammed the door. She slammed the door angrily. It’s not a case of avoiding abbreviations – we just don’t write these things! When I saw this for the first time, I had to ask what it meant. If you mean “kind regards”, you have to write “kind regards” if you want your English speaking reader to understand you. 10. How does it look like? This is used when you want somebody to describe something to you. What shape is it? What colour is it? How big is it? You want to know about its appearance. I finished my list when I got to number 10 but if you have any more ideas, you can write them in the comments section! As this post was so popular, I decided to write another one and look at 10 more mistakes. You can find the second post in the series here. If you would like help to make sure that you are not making these or other mistakes, I offer one-to-one English lessons online. If you would like more articles like this and other news from English with Kirsty to be delivered straight to your inbox, you can sign up for my monthly newsletter. You can also receive my free information sheet which gives you 20 tips on improving your reading,speaking, writing and listening skills. 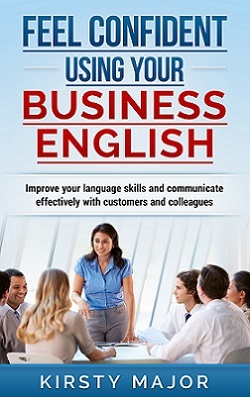 You may also be interested in my book, “Feel confident using your business English”. Would you like to support this website? There will always be free content on this site for learners to enjoy, but if you like and have benefited from the content here, you can support the site by buying me a virtual coffee. Payments are made via Paypal. 1.) “I remember me…” instead of “I remember…” this happens because in German the verb “erinnern” is reflexive: “Ich erinnere mich…” whereas in English, it’s not. 3.) Confusing numbers; e.g. saying 97 “seventy-nine” instead of “ninety-seven”, because in German you start with the rightmost digit of a number “Siebenundneunzig” instead of the other way round. For example, once one of my students told me: “The ticket was guilty” meaning “The ticket was valid” because of the German word “gültig”. “Let’s meet us” is a very common one as “sich treffen” is reflexive in German, too. “Next to….” instead of besides is another one. And a funny one is the word “roundabout”. The price is roundabout (instead of about/approx./ca.) 8 €. Thanks Nicole – I might do a separate post on false friends! Thanks Mailin! Actually they may have picked up “round about” from native speakers as I’ve heard that before. It’s one of those cases where two similar words are used (around and about) whereas only one is necessary because they mean the same thing. I think there is a name for that but I don’t know what it is! O yes, I see sentences like this all the time, too! “You need to have this finished until Friday” (instead of by Friday). Thank you for these. I hear too much of the verb ‘make’ with my German speakers (probably because machen seems nigh on universal in German). “I make a party, I make holidays ” are the worst offenders but stuff like “she makes a crossword”. Its a difficult one to teach as although there are general rules, they seem to be constantly broken by loads of exceptions. Maybe I will write an article and send it to you to publish…. One of the most common mistakes made by Germans when speaking is the pronunciation of the letter “A”. Sometimes it’s like the German e.g. “CAT” and sometimes not like “CAME”. Some insisting on pronouncing it like ää or ee in German. But then again not everyone in the British Isles speak perfect English either. Yes, Sandra, I agree! The rules don’t always help. “Make” and “do” often appear in the wrong places and although it’s usually “make” that’s used incorrectly, I’ve seen problems with “do” as well such as “do a mistake”. Yes, Joseph, I know what you mean. I have heard the A in cat pronounced like the first E in kettle and some other learners have difficulty with the V, W and TH sounds. As for speaking the language perfectly, I think it’s the same wherever you go! As I mentioned above, I work with a range of learners but as I speak German and most of my work comes from Germany, my main objective was to begin a short checklist of tips which could be useful for learners so that something useful can come out of the common mistakes. It’s great that other teachers have added to this list – learners are welcome to do so too! German here. :) “We discussed about [topic]” instead of “we discussed”; saying “it irritates me” when feeling confused (German “jemanden irritieren” = to confound somebody), calling it “vacation” when having 2 days off and slacking off at home. :-) I really liked your article! This stems from the acceptable of “MfG” for “Mit freundlichen Grüssen” hence why Germans feel that “BR” and “KR” are perfectly acceptable and logical additions to the end of their emails. Yes it’s a natural assumption that KR is as acceptable as MfG and it seems to be used regularly in some German companies where the company language is English. I think that people copy their colleagues and then believe that everybody uses this abbreviation. Therefore I just wanted to point out that it’s not something that native speakers would write. I also come across “informations” and “infos regularly. Presumably these mistakes are made because learners have learned that in most cases, an “s” should be added in order to form the plural of an English word. However every rule has exceptions! Compounding or hyphenating nouns (in written English, not spoken, obviously). “Helpdesk” rather than “help desk.” “Chickenliver” instead of “chicken liver”. Yes, I corrected homework which included the word “trainstation” yesterday. One thing I constantly hear, even from Germans who have lived in the US for many years, is the misuse of the simple present, which works perfectly in German, but not in English, even though it probably should. Example: “I see you later tonight at the restaurant.” “I go to the store now.” For some reason, we ceased to use that simple present tense most of the time, and instead use the present continuous form: “I am going to the store now.” To make it even more confusing, we also use the present continuous tense as the future: “I’m going to the store tomorrow.” And even worse, we sometimes DO use the simple tense just like the Germans often misuse it: “I go to the doctor at 4PM today.” Why does that sound fine, when “I see you at the restaurant later” doesn’t? Yes, there are more tenses in English than in German and as you have pointed out, we use a number of them for talking about events in the future. I think I would choose a different future tense for the example about the doctor, but the simple present is often used for certainty about scheduled events, such as “the concert starts at 7:30”. One error that even non-native speakers with an almost native command of English make is when describing something with a numerical adjective, they use the plural rather than the singular form. For example, they say “We signed a five years contract” or “It’s a 100 pages document”. Many of my work colleagues who even ask me to correct their English errors cannot seem to get this right. I don’t think it’s just the non-native speakers who get caught out with that one. In fact, I think it’s becoming more common! Thanks for adding it to the list.